Upcoming mixed-use development featuring 73 apartment residences ranging from studios to three-bedrooms and approximately 4,500 square feet of retail located steps to Egleston Square and the MBTA Orange Line. Resident amenities at 3200 Washington Street will include a rooftop terrace, a private 8,800 square foot outdoor courtyard, a 5,600 square foot wooded green space and interior lounges. A separate triple-decker with 3 condominium residences will be constructed on the same site. A total of 12 residences across both buildings will be designated affordable. Exterior work is ongoing and window install is nearly complete for the mixed-use project at 3200 Washington Street in JP. The two building project will consist of 73 apartments and two ground floor retail spaces. Resident amenities will include a private 8,000 square foot courtyard and over 5,000 square feet of green space. Exterior work and window install are ongoing for the upcoming mixed-use project at 3200 Washington Street in Jamaica Plain. The project is set to include 73 apartments and around 4,500 sf of ground floor retail between two buildings. The buildings will share a common lobby and residents will have access to a rooftop terrace and a large outdoor courtyard. Parking for 41 cars will available on site through garage and surface spaces; bicycle parking will be offered as well. Berkeley Investments has confirmed that construction of the 100,000-square-foot 3200 Washington Street mixed-use development in Jamaica Plain in now underway. 3200 Washington Street will feature 73 apartment residences and approximately 4,500 square feet of new ground-floor commercial space in two main mixed-use buildings joined by a common lobby, as well as three condominium residences in a separate triple-decker home. Demolition of existing buildings on site is nearing completion, after which construction of the buildings' foundations will begin. Financing for 3200 Washington Street is provided by Santander. 3200 Washington Street is expected to open in early Fall 2018. Residences will range in size from 450 square feet to 1,300 square feet, with rents ranging from $2,000 to $3,000 per month. A total of 12 residences at 3200 Washington Street will be designated affordable, including nine apartments for households at 70% and 100% of area median income (AMI) and three 3-bedroom condominiums for households at 70% and 100% AMI. 3200 Washington Street will strengthen the growing Egleston Square community with new mixed-income housing options and street-level retail. “It’s exciting to be a part of the energy here on Washington Street, and we look forward to working with community leaders to enrich this neighborhood,” says Berkeley Investments Development Project Manager Esther Byun. “[We are] proud to support this development project. Not only will it add new businesses to the area’s commercial mix, but it also incorporates affordable rental and home ownership options while activating a site that’s been vacant for years,” says Egleston Square Main Street Executive Director Luis Edgardo Cotto. 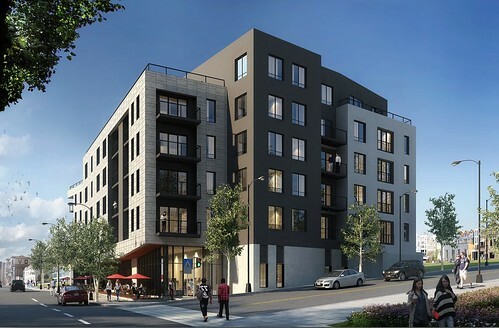 Berkeley Investments has secured $21.5 million in construction financing for the approved 100,000-square-foot 3200 Washington Street mixed-use development in Jamaica Plain, allowing construction of the project to proceed. Santander Bank is providing financing for the project; demolition of three existing abandoned one-to-story commercial buildings is now underway. 3200 Washington Street will feature 73 apartment residences with ground-floor retail and is located steps to Egleston Square. New renderings of 3200 Washington Street have been revealed depicting the project’s modern aesthetic and amenities including multiple resident lounges and a rooftop terrace; these renderings are posted above.